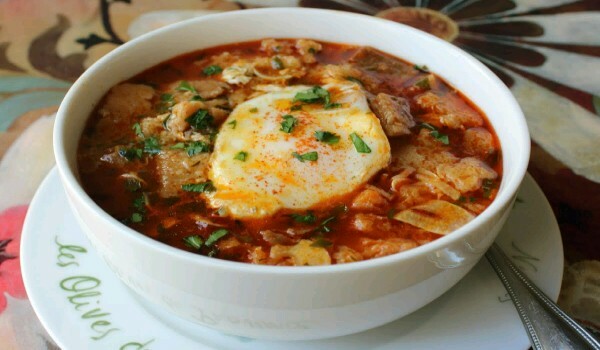 Spanish Garlic Soup is an appetizing soup, flavored with onion and garlic. Learn how to make/prepare Spanish Garlic Soup by following this easy recipe. Heat olive in a large soup pot. Add onion and garlic and cook over medium heat, for 10-12 minutes. When onion and garlic begin to caramelize, add wine and cook for another 20 minutes. Now, add the stock and bay leaf. Bring to a boil. Reduce the flame and let it simmer for 30 minutes. Turn off the flame. Add bread cubes and allow to sit. Add cream and adjust seasonings. Garnish with cheese and serve in shallow bowls.